ommeau de Normandie is a fruity drink, with strong hints of baked apple, fresh creamery butter, and a touch of caramelized sugar. It's made from a blend of one-third Calvados and two-thirds fresh apple juice. It is then aged in oak for three years to achieve the essential mellowness. The people of the Normandy have enjoyed Pommeau for generations. But it wasn't until 1986 that the French government approved the regulations for Pommeau, allowing it to be exported. Pommeau de Normandie has been Appellation Controlled since 1992. 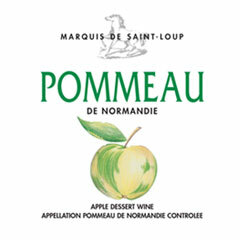 Pommeau "Marquis de Saint-Loup" should be served chilled in a traditional tulip glass. It's excellent mixed with sparkling wines, or for creating cocktails. It particularly enhances melon and foie gras, and naturally complements a harvest season dessert. When cooking, Pommeau adds its distinct apple notes to sauces and cream dishes. Copyright © 1999-2015. Pup's Cider Co., LLC. All Rights Reserved. Unauthorized duplication of, use of, or linkage to any content herein is prohibited.